Edwards Mountain Woodworks is operated by Bill Anderson, an expert woodworker and teacher specializing in the techniques and technology of woodworking in the 18th and 19th centuries. He owns an extensive collection of handplanes, including over 900 molding planes and wooden benchplanes, some dating back to the time of the American Revolution. “I have recently retired as a research scientist at the United States Environmental Protection Agency. My commute is now 100 feet down the hill to my shop—what a joy! My father grew up self-sufficient on a farm in North Dakota. He made everything he needed in his shop and called it “implementing”. I like to think that I have inherited some small aspect of that approach to life. “I am particularly intrigued by the techniques and technology of woodworking in the 18th and 19th centuries. 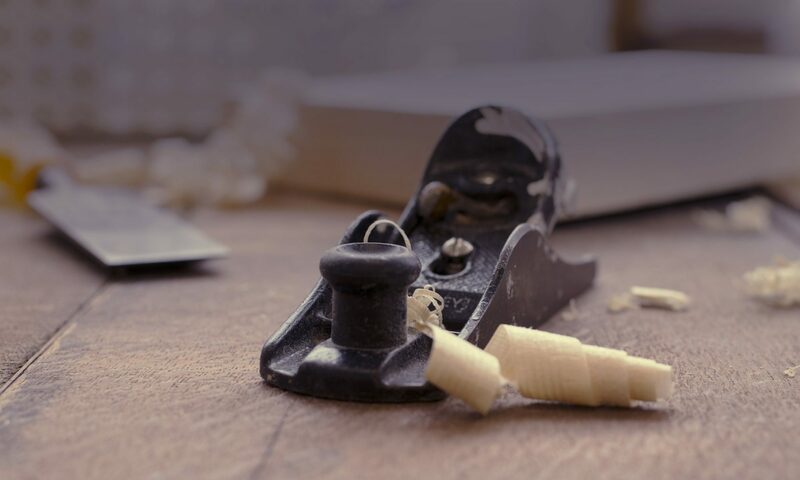 I find the old tools, particularly handplanes, to be endless fascinating and it is my goal to understand these tools to the greatest extent possible. I use these handtools and handtool skills in my woodworking and feel that it reflects my reverence for the wood, for the tools and for the capabilities and ingenuity of those craftsmen. “I would say that the furniture I have made is contemporary with serious traditional influences. I like to incorporate handplaned moldings into my work and all of the joinery is handcut. I work carefully and with attention to detail, believing that my goal is to become one with the piece I am working. From a furniture history point of view, my influences come from the Shaker, Chippendale and Queen Anne and more recently the Windsor styles. “My shop combines both handtool and power tool approaches, although I seem to be using my power tools less and less these days in favor of the quiet and contemplative environments of the handtool shop. I have an extensive collection of handplanes, including over 900 molding planes and wooden benchplanes, some dating back to the time of the American Revolution. I have a particular interest in handplanes for window sash making and in planes made by Josiah King (working in the Bowery in New York City in the mid 1800-s). I have never met a handplane that I did not like! Dovetail Saw Guide. American Woodworker (1996), no. 51, page 22. Disc-Sander Miter Jig. American Woodworker (1996), no. 51, page 24. Workbench Clamping Jig. Woodwork (2001), no. 72, pages 62-64. Dovetail Shortcut. Woodworker’s Journal (2005), 29(2), page 14. Angle Clamping Jig. Woodcraft Magazine (2006), 3(14), page 46. A Shop-Built Carving Holder. Woodwork(2007), No. 107, pages 60-63. Build a Bowsaw. Popular Woodworking(2011), No. 193, pages 44-49.